Up to now, we've recorded a bass line in two different ways: directly from the instrument and via one or several mics placed in front of a bass amp. As you were able to hear, each of these methods has its own character, both from a spectral and dynamics point of view. And with that alone you ought to have plenty to do. But sometimes, only one of these recordings isn't enough to faithfully capture the sound you have in your head for the song you are working on. 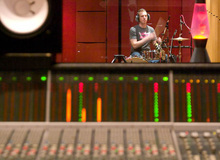 Fortunately, you can always mix two takes or even more to get the best of all of them and get THE sound. But there's one thing you need to pay special attention to: the phase correlation between them. This clip is the result of two takes from last week: one recorded with an SM57 almost glued to the grille of the amp, on axis with the speaker, and the other one is from a C414 placed at about 8" from the grille aimed towards the external rim of the cabinet. The first example is clearly useless since the phase relation between the two signals kills the body of the sound. The second is still not optimal, the third one is on the right path but the overall result is still somewhat "weak," since some notes seem to "vacillate," for lack of a better word. For its part, the last clip is clearly more "solid," the result is "full" with almost no artifacts. And even more important is the fact that it corresponds better to the actual sound of the bass I heard during the recording, in other words, it's the sound I wanted to capture. From this it's obvious that this is the way to go. First of all, it's completely unreal to try to get a perfect result. Without getting into any technical details, you should know that whenever you mix two different sources of the same instrument you are bound to end up with some artifacts. However, while these imperfections might be clearly audible when listening to the bass track on its own, they will surely be much less obvious mixed together with the rest of the elements of the mix, if you do a good job, of course! So, in short, you should always strive for the best, but forget about perfection. Second, it's important for you to know that I adjusted the volume of each clip for a more comfortable listening. Because, in reality, phase issues entail loudness variations, which usually makes it easier to identify the problems. Okay, now that the problem has been clearly stated, it's time to come up with some solutions. As you've already seen in a previous article of this series dedicated to the art of recording, the 3:1 technique is a good starting point. 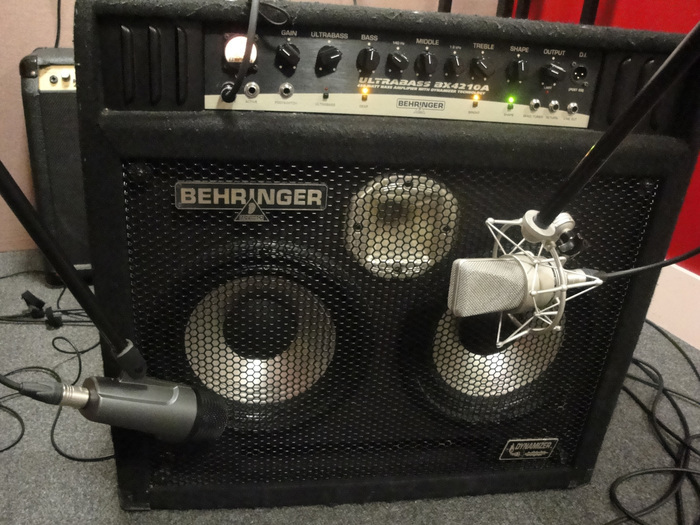 Except that when it comes to recording a bass you have to consider the direct recording (which can be considered to be at a zero distance from the source), too, not only the mic recordings. And three times zero is... zero. In this case you could move randomly the mics you wish to mix with the DI recording until you find an adequate spot...which can prove lengthy and tiresome. Fortunately, there are more practical solutions! For starters, there is gear specially conceived to tackle this issue, like Little Labs' IBP or Radial Engineering's Phazer. Putting one of these in the signal path you can continuously adjust the phase of the signal and even target the frequency range affected. That way you solve the problem from the get-go. If you like mixing direct recordings and mic takes of an instrument, I guarantee the investment is worth it. The less fortunate among you will have to make do with solving phase issues later, during the editing stage, by shifting the different takes by hand. Personally, I think it's a bit risky to leave things for later, so next week I'll let you in on a much more satisfying "poor man's" solution! We interview the author of "Beatles Gear: The Ultimate Edition"